Today I am sharing with you my project for the Your Next Stamp July DT Dare. This month, we were challenged to create with the theme "It's a Guy thing". I am using Your Next Stamp's, Krash the Horse stamp set. As soon as I saw this set, I knew that I wanted to create a race horse card. Maryland is big on horse racing, my mother actually grew up riding and only stopped a few years ago because her knees no longer allowed her to do it. You can find this set as well as the rest of the July re-release by Your Next Stamp... CLICK HERE!... at the Your Next Stamp Store. Don't forget to visit the Your Next Stamp Blog... CLICK HERE!... and be sure to leave a comment on the DT Dare Post for your chance to win a stamp set of your choice. I created a slider card today. A horse racing slider card... Wooo whoo! I used some Distress Inks in both the original and oxide variations to ink blend my background. I then cut out the front panel of my card using the Your Next Stamp Stitched rectangle die set. 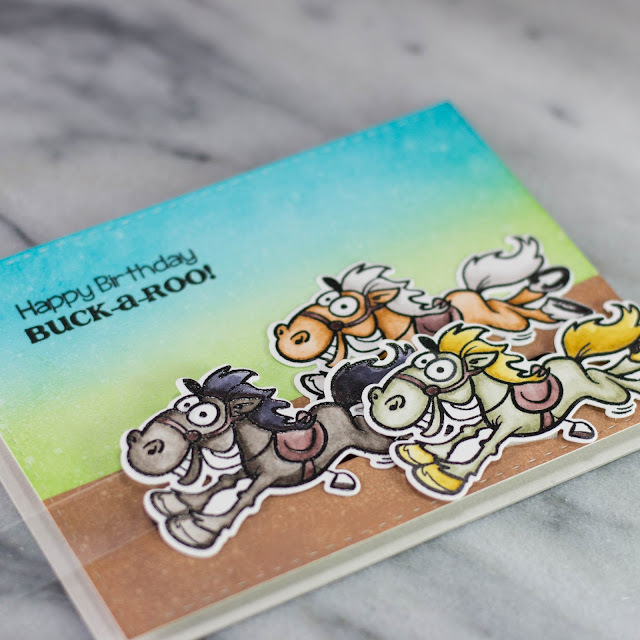 I stamped three horses and clear heat embossed them to color with my Zig Clean Color Real Brush Markers. After I cut them out with the coordinating die, I attached one to a slider element by MFT and the others where adhered via foam tape or tape runner in their perspective race positions. 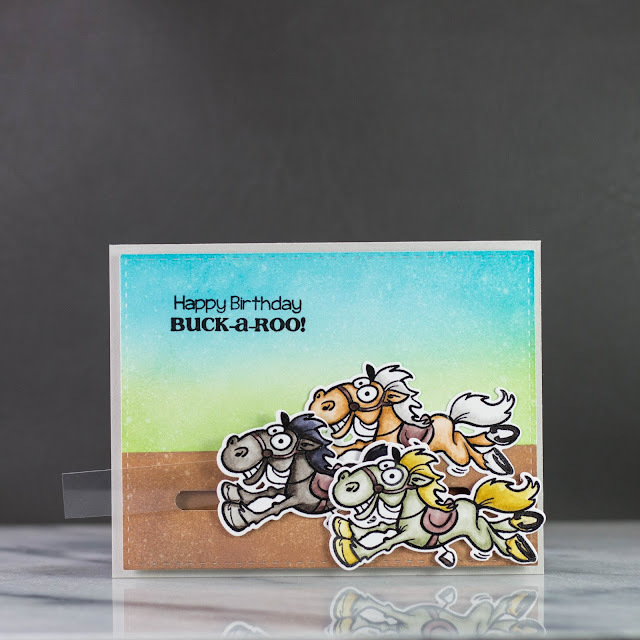 The sentiment, also from Krash the Horse stamp set, was stamped with Versafine Onyx Black to finish it off. For Photos of my card, a link to the YouTube Video creating this project, and links to the supplies used, look below. Thank you for visiting my blog today, and don't forget to visit the Your Next Stamp Blog and leave a comment for your chance to win a stamp set of your choice. Such an adorable card Koren. Such an amazing interactive card Koren.